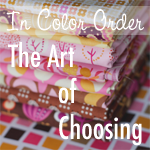 Recently I ran across Jeni Baker's series on The Art of Choosing. It's a fabulous series, starting with how to recognize a fabric's overall color, and stash folding, organizing and storage. I figured before I worked on stash building, it behooved me to do some organizing first. Most of my fabric was in large piles of flat pieces. Folding this way just makes a lot of sense for seeing what you have. You can see one of my first mini-bolts in the first picture above. I'm happy to have found a way to easily store yardage. More on that later. I'm linking up with Molli Sparkles at Sunday Stash. Posted in Fabric on June 15, 2014 by sarah. I love that middle print on the last photo, really pretty. You asked what I was going to do with my spools, come check it out. Can't wait to use them in more "photo shoots"
Thanks, Mara. I think I might need to make a top or dress for The Girl out of that fabric. I'd still have plenty left to use in a quilt. Oh, and I love the spools in your fabric shot! Love the greens! I love organizing my fabric - but then I think of new projects and it's all a mess again! Folding makes lots of sense. When I first started reorganising my fabrics, I got a whole lot more use from them and came to appreciate them a lot more....even the little pieces! These greens are lovely and remind me of a rainforest! Thanks! And it's amazing how even the ugliest fabric can look good in a stack of coordinating fabric.